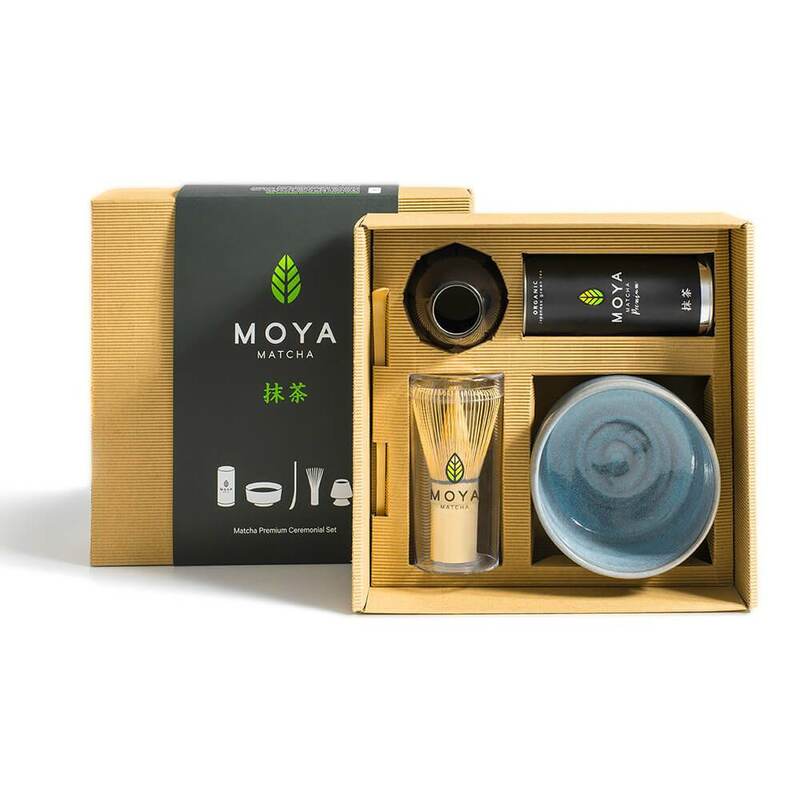 Matcha Premium Ceremonial Set is a perfect set for all adepts of tea and the traditional Japanese matcha tea ceremony also called “The Way of Tea”. 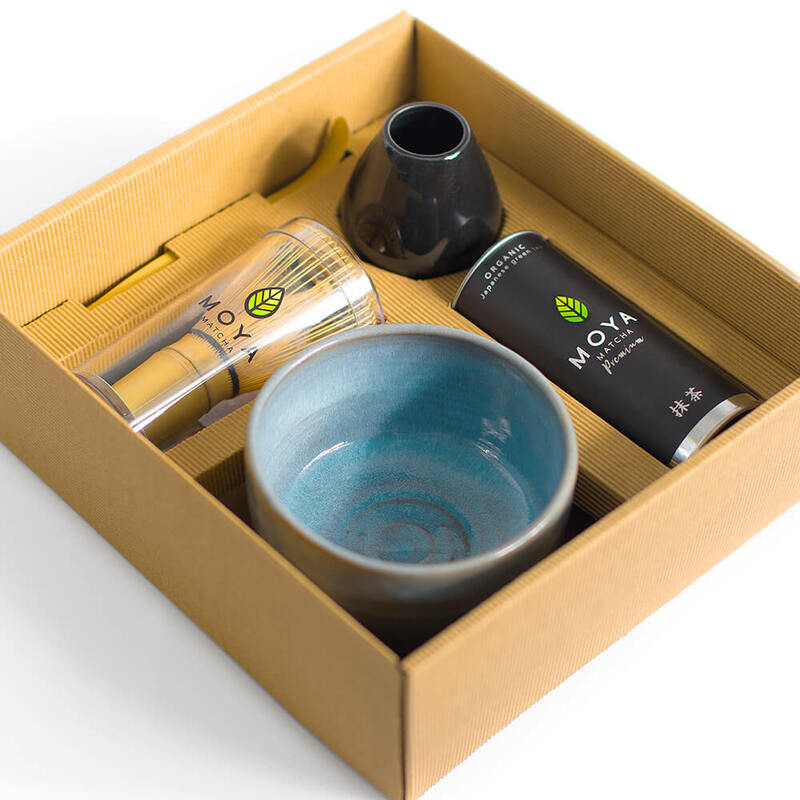 It’s also a great gift for those who are just starting their matcha journey. Highest quality organic matcha from the youngest and finest leaves of the first harvest. Used for traditional tea ceremony, it possesses a rich mellow sweet taste and creamy texture and is distinguished by its vibrant jade green colour. 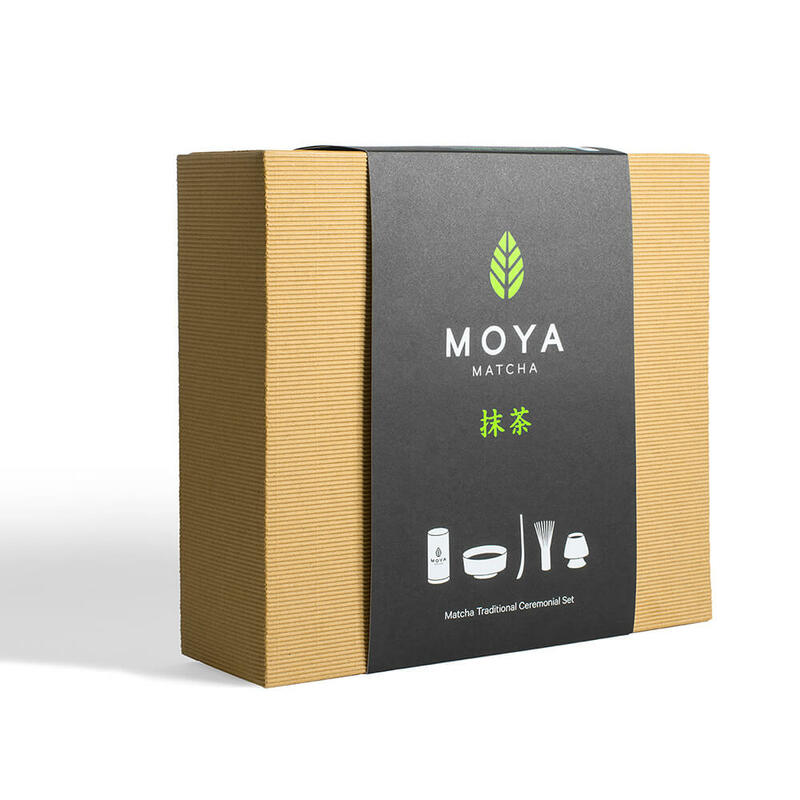 Moya Matcha Premium is obtained in the 1st harvest from tea plants that are specially shaded from direct sunlight. This results in higher chlorophyll and L-Theanine contents and a richer, greener color. Only the finest, most delicate fresh leaves are collected, dried and ground to powder. Handmade matcha bowl from fireclay with glaze finishing. 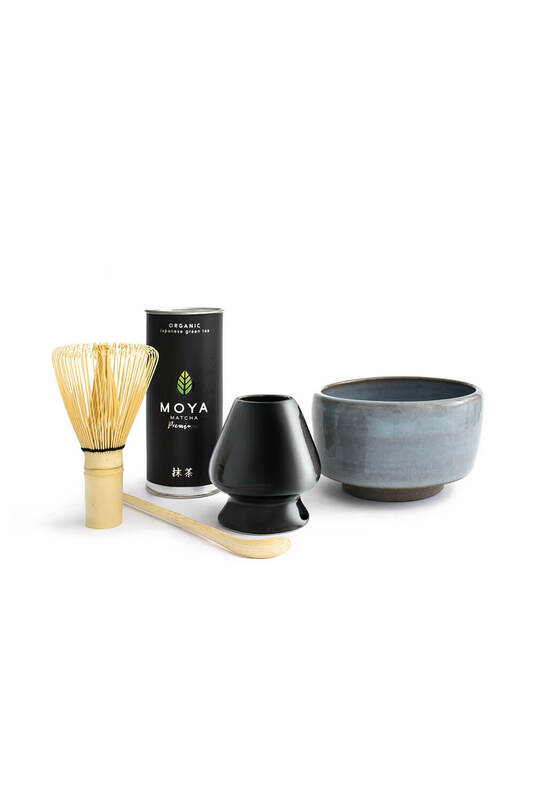 It is shaped according to centuries’ old Japanese tradition from Kyoto adapted by a small ceramic studio in Cracow in collaboration with Moya Matcha. Each piece of stoneware is unique with its own natural and subtle variation. It is fired at very high temperature providing safety and durability. Matchawan is the traditional bowl used in the Japanese tea ceremony and makes matcha preparation very easy. When whisking matcha with a bamboo whisk (chasen) the tall vertical walls of the matchawan help to prevent the water from spilling. The broad bottom of the bowl makes it easy to whisk the powder smoothly inside and quickly obtain the perfect froth on the surface. Please remember to use water not exceeding 80 °C temperature to preserve all the matcha properties. Volume: 400ml Height: 7,5cm Diameter: 11,5cm. Dimension may vary to a small degree. Country of origin: Poland. Dishwasher safe. Packed in individual cardboard box. The traditional matcha whisk holder is not only a beautiful element of the traditional Japanese matcha tea set. It is a very practical tool that helps your chasen dry faster and maintain its shape and durability. Material: porcelain. Size: 7cm (height) x 6cm (diameter). Color: Onyx black. Dishwasher safe. Chashaku is the traditional Japanese spoon for serving matcha and an integral part of the matcha tea ceremony. The curved portion of the spoon is used to scoop a small portion of tea and place in a bowl (matchawan). The mixture is then whisked to uniform consistency using a bamboo whisk (chasen). The amount of matcha served depends on individual preference. The thin tea or “usucha” is prepared with one or two chashaku of matcha and approximately 100ml of water. Material: Bamboo. Length: 18cm. Not dishwasher safe.